Accident management firm Drive Assist was dragged into a £24.9m pre-tax loss last year by hefty debt interest payments of £48.6m, its latest accounts have revealed. The pre-tax loss, which follows a torrid year for the accident management sector, was an improvement on the £29.1m it racked up in 2009. Net debt for last year stands at £556m, compared to £436m in 2009, accounts say. Private equity firm Charterhouse, which also backs insurance broker Giles, is a majority shareholder in Drive Assist. The firm’s finance director Chris Wright stressed that the interest payments did not equate to cash going out of the company. Pointing to the positives, he said that operating profit was up from £18.6m to £22.9m and turnover rose from £155.2m to £157.1m. Between 2009 and 2010, the firm cut staff numbers from 1,742 to 1,409, which reduced its total wages and salaries from £28.7m to £25.7m. Other accident management firms have been struggling with huge debts and the fallout from the economic downturn. 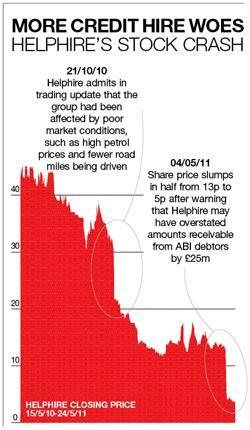 Earlier this month, Helphire’s shares crashed after a profit warning. This time last year, the shares were valued at 43p. Now they are worth just 3p. The firm said it may have overstated amounts receivable from ABI debtors by £25m. The firm also expected its profits for the year to 30 June 2011 to be “significantly below market expectations”. Helphire has hired consultant KPMG to help identify the cause and amount of the overstatement. It attributed the reduction in hire length to fewer accidents, which in turn is being driven by lower car use because of the economic climate and higher petrol prices. In September last year, Accident Exchange, which was struggling with large debts, delisted from the stock exchange. In February, it struck a debt-for-equity deal, which cut its debt liability by £50m. The firm also entered into a new three-year credit agreement with its senior lender Morgan Stanley, under which the bank would extend it £43m of working capital facilities until December 2013. To add salt to the wound, in February Allianz challenged Accident Exchange over a credit hire bill for England international footballer Darren Bent. Bent paid at least £20,000 too much in credit hire fees and should have shopped around, a Cambridge country court ruled in February. Drive Assist had its own embarrassing affair to deal with when a whistleblower claimed there was deliberate overcharging to insurers for vehicle hire days. An email was leaked to insurers in March last year. Chief executive Steve Binch denied the allegations that the firm had misled insurers, stressing that the email was sent by a staff member “misunderstanding” the discussion at a team meeting on hire days. He said there was no wrongdoing and that he believed the whistleblower had an axe to grind, owing to the large number of redundancies made by the firm. - Private equity firm Charterhouse intends to sell or float Drive Assist at some point. But with interest payments on debt mounting, does it have any idea when it wants to make an exit? - Will one of the big accident management companies go bust? After a torrid 2010, there are concerns among insurers that one of the market players could fall into administration.